Thanks for visiting my website! I'm an Atlanta native who grew up watching the Braves, in the good years, and in the bad. 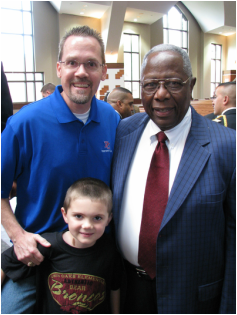 In fact, three years ago, at the Civil Rights Game festivities, I met my all-time favorite player, Hank Aaron, the true home run king! I've witnessed all three of my children being born, married my best friend, and can testify to so many things the Lord has done for me and my family, salvation and grace through Jesus, etc. So, I was surprised how deeply satisfied I felt after meeting my childhood hero. I think it's a sports fan thing! Aaron's accomplishments on the field are unparalleled, but his undaunting drive to play Hall of Fame caliber baseball in the face of bitter racism and prejudice is worth admiring - regardless of your heritage! Hammerin' Hank, me and my son, Matthew. Chipper, me and and an older Matthew! Sadly, the organizers rushed us through a photo opp. Hence, Matthew lost his right eye. PLEASE NOTE: My job and husbandly/fatherly duties necessitate weekend mailing only! Now, I can't wait for the Topps Heritage set in 2021: the modern players in '72 style cards! Started 2/1/19 These are really nice cards! I'd like to have all Hall of Fame players in any year from the Red Man set. Being a Gestalt kind-of-guy, only the cards with tabs will do. 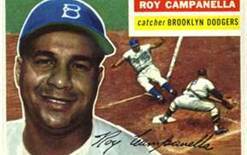 This is a HAVE-HAVE list: Fox, Musial, Rizzuto, R. Roberts, and Wynn. ​I need any other HOFer from any year Red Man set! VERY CONDITION SENSITIVE - I prefer no cracks or curling (EX-NM). Completed by my hobby-supporting wife on Christmas 2018! Completed by my awesome wife on my 50th birthday!